The skeletal scintigraphy or bone scan is the most sensitive method for the presentation of bone metabolism. This metabolism may alter on the basis of various diseases (e.g. arthrosis, arthritis, bone tumors and metastases, fractures, loosening of implanted joints, infections, osteonecrosis /-porose or Sudeck’s atrophy). With bone scan changes in bones can be detected up to nine months earlier than with other imaging techniques (e.g. X-ray, CT or MRI) . An inconspicuous bone scan largely excludes a disorder of the bone. 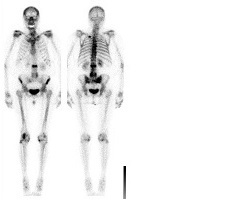 The skeletal SPECT / CT examination shows both the bone metabolism and the bone structure in detail. The scintigraphic images are superimposed with computed tomography, so that both the metabolism (functional information) and the structure of bones and joints (anatomical details) can be imaged and diagnosed. Computerized tomography is carried out with an extremely low dose – thanks to the latest technology – in order to avoid unnecessary radiation exposure. In this way, precise diagnoses can be made in a single examination procedure. SPECT/CT is redefining the diagnostic workup of patients with suspected or known infectious and inflammatory processes involving the musculoskeletal system as well as those with infectious and inflammatory disease located in various soft-tissue sites. In this procedure radiotracers are used that indicate highly specific inflammatory origins. With the aid of computed tomography, the focus of inflammation can be precisely localized. The bone density measurements using DXA is the most appropriate method to determine osteoporosis under early detection, to evaluate the current stage of osteoporosis and to allow monitoring of therapy for patients with known osteoporosis.